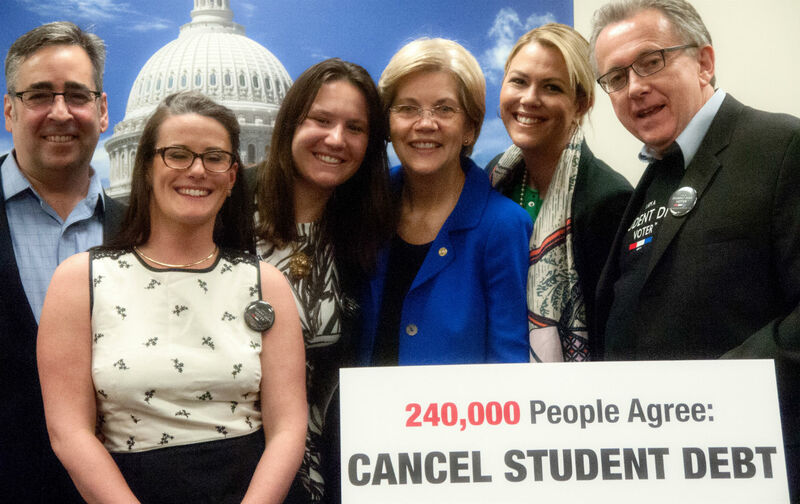 “We need to get back not only to low tuition, but to no tuition,” said Roger Hickey, sporting an “I am a student debt voter” T-shirt outside Senator Elizabeth Warren’s office last Thursday. Hickey works for Campaign for America’s Future, and on April 30, he helped deliver a petition with over 240,000 signatures to Warren’s office. The petition, which gathered its signatures all in one month, demanded that the US government cancel all student debt, public and private. There are currently 40 million student loan borrowers with $1.3 trillion in debt, which “pales in comparison to what we spent on the Iraq war,” said John Hlinko, founder of Left Action. “So what about a similar war on debt?” While there has been a huge increase in military spending, Pell grants, or money given to low-income students that does not need to be repaid, have been cut from the current budget. Many are starting to feel like the right to accessible education is under attack. The petition given to Warren was sponsored by a coalition of organizations including Campaign for America’s Future, Democracy for America, Working Families, Daily Kos, and The Nation, among others. Senator Warren has spoken out frequently about reforming student loans, and she recently tried to introduce a budget amendment that would have decreased the interest rate on loans to 3.9 percent, but Senate Republicans blocked it. She also recently joined a liberal push to make college at least debt-free. Student debt has also worsened inequality in the United States by burdening working- and middle-class students and keeping them at the bottom of the social and economic ladder. Other countries, however, despite lower federal budgets, don’t seem to be facing this issue with the same severity. Mexico, a poorer country than the United States, currently has certain universities that are free with a high-quality education. Similarly, in Quebec tuition fees are below $2800 per year. In 2012, when the government tried to raise tuition, there was a massive student strike which forced the government to scrap their proposal. Student debt is bankrupting students before they even enter the workforce. Hlinko said he believes investing in education is beneficial for the future. “This is the best investment we can make, an investment in our people,” he said. Nadia KanjiNadia Kanji is the Nation's spring 2015 DC intern.